The pair, sipping some of Colbert’s rum, talked about Hedges’ role as a young man struggling with addiction (alongside mom Julia Roberts) in Ben Is Back, which was written specifically for him by the film’s director, Hedges’ father Peter (Pieces Of April, Dan In Real Life). “When the eventual Behind The Music is done about your life, they’re not going to run this are they?,” joked Colbert, as he poured his guest some hooch. Speaking of Hedges career path so far of playing tortured, intense people (including his current Broadway role alongside Elaine May in The Waverly Gallery, written by his Manchester By The Sea director Kenneth Lonergan), Hedges confessed that he’d like to try something a little lighter someday. Perhaps even something . . . furry? 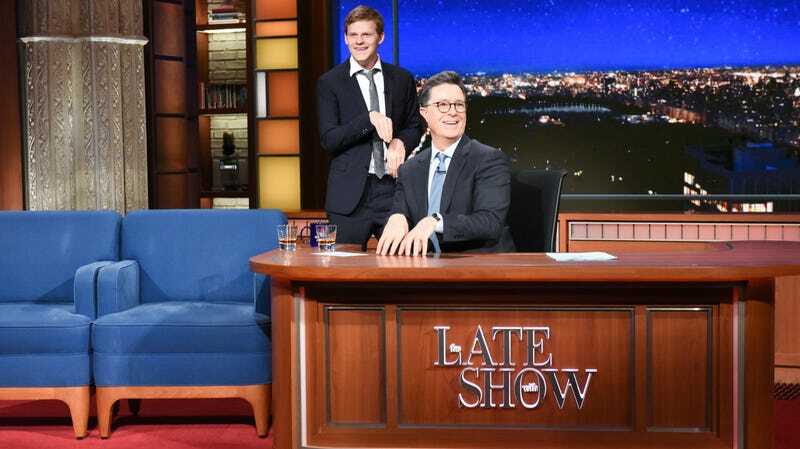 Telling Colbert that he warms up for his theater performances by singing selections from Cats, Hedges was goaded into doing a little “Rum Tum Tugger” by his host, the booze and the fact that Late Show bandleader Jon Batiste knew the song prompting him to his feet. Sure, he didn’t know all the words, but the kid’s a gamer, especially with a thimbleful of rum in him.